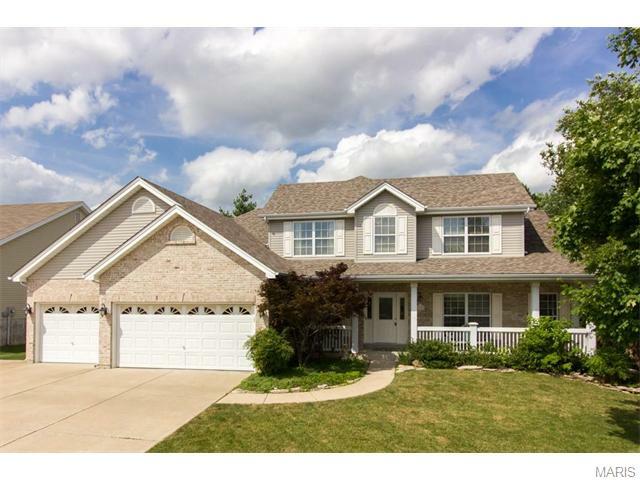 Located in St. Charles County real estate, homes for sale in St. Peters MO are located close to I 70 leading into St. Louis County/City. St. Peters Real Estate is made up of both residential and commercial properties and offers numerous dining and shopping options. St. Peters MO Real Estate and St. Peters MO properties are a perfect addition to the St. Louis Real Estate market. St. Peters MO real estate has an average home age of 25 years. Homes for sale in St. Peters MO range in price from $100,000 to $500,000. The median home price in 2014 was approximately $185,000. Residents of St. Peters can enjoy The St. Peters Rec-Plex that has something for everyone in the family. There are two facilities to choose from. The north Facility provides cardio, weight training and fitness areas, indoor pools, basketball/volleyball gym, ice rink and an indoor track. Rec-Plex South provides a gym and two additional ice rinks. St. Peters properties are served by three School Districts; Fort Zumwalt, Francis Howell and St. Charles. See Great Schools for up to date ranking on every school in the area. If you are looking for a home for sale in St. Peters MO or you would be interested in buying a home in St. Peters, please contact St. Charles real estate expert, Sharon Colona and St. Louis Realty for a professional and simple buying or selling process. Call (636) 397-7653 or email at scolona@stlouisrealty.net. Just 3 years young, impeccable 1.5 story w/ outstanding waterfront views situated in a quiet cul-de-sac & tucked away on premier. .25ac lot. Upon entering you are greeted w/ open floor plan leading to cozy office. Sophisticated living room leads to gourmet center island kitchen w/ granite, custom cabinetry w/ crown molding, Jenn-air double oven & gas range, walk-in pantry & sunlit brkfst rm w/ access to level & fenced backyard. Great rm boasts 20 x2019; ceilings, gas fireplace w/ marble surround, wall of windows & custom wood encased archway. 3 window bayed master suite w/ gas fireplace & lux bath including WIC. 2nd floor offers 3BR x2019;s, all with WIC's plus Jack-n-Jill bath. Downstairs you x2019;ll discover a den, 2 large BR x2019;s, full bath & plenty of storage. Expansive 2 tiered composite deck & patio to enjoy picturesque views & sunsets. Easy access to hwys, parks & Mid Rivers Mall. With over 4200+sf this home offers great intelligent attention to detail that has resulted in remarkable spaces. This 1852 Plantation Style home is looking for the right buyer. Beautiful 4.19 acres conveniently located in desirable St Peters and Francis Howell School District. This house has lots of potential and a great opportunity for the savvy investor; rather you restore this home to its original Splendor or pursue unique business opportunities, this may be the property you've been looking for. Gorgeous ranch on a cul-de-sac in the highly-coveted Ohmes Farm subdivision, with 12-foot ceilings, open floor plan and a fitness room. You x2019;ll love the layout of the 2,340 sq. feet on the main level and another 1900 sq. feet of finished space in the lower level. The kitchen is a chef x2019;s dream with many upgrades like double ovens, tons of cabinet space and a coffee bar. This home features countless perks like built-in speakers in the great room, custom blinds, a jet tub and oversized shower in the master suite, 75-gallon hot water heater, sump pump, insulated interior walls, 220-V in the massive 3-car garage and a main level laundry room with a deep sink. There x2019;s a second master suite in the lower level for guests or in-laws, with a cavernous walk-in closet loaded with custom-built shelving. This is a rare lot in Ohmes Farm on a quiet court, backing to a city-managed nature area with with walking trails, and the best schools in the Fort Zumwalt District. Welcome home to this amazing 5 bedroom/3 bath Ranch w/ over 3200+ finished sqft. Sitting on over 4 acres w/ 18 x 30 detached garage & 30 x 50 insulated utility building! Enter into the foyer w/ vaulted ceilings & take in this beauty! Great room has wood floors & a stone surround fireplace. Kitchen features quartz countertops, SS appliances, & oak cabinetry. Breakfast room walks out onto the beautiful covered wood deck. Dining room features beautiful coffered ceiling! Main floor laundry. Master bedroom suite offers two oversized windows, walk-in closet, double sink adult-height oak vanity, huge onyx designer shower & separate soaking tub! Main level offers two more spacious bedrooms & second full bath. Head down to the lower level to find meticulously maintained atrium. Large open family room, 3rd full bath, & two more bedrooms on this level! Also, walk-outs to both patio & the 3-season room! This property boasts a newer furnace, roof, & siding. Don't miss out on this amazing property! MOTIVATED SELLER! Fantastic 1.5 Story Home for Large Families w/Over 4300 sq ft. 4 Bedroom, 4.5 Baths. Short walk to park & lake. Quaint dining in historic Cottleville. Golf Cart Community. Fabulous floorplan w/sep living quarters perfect for Mother-in-Law Suite w/private bath. Chef x2019;s Kitchen w/42 x2019;' solid wood cabinets, 6 Burner Gas Stove w/double ovens! Granite Counters & stainless steel appliances. Massive Hearth room w/2nd woodburning fireplace Great for Large Harvest Table & Family Gatherings. Main level Master Suite plus 2nd Level Master w/Private Bath. The upper level offers a total of 3 Large Bedrooms. Extensive Lower Level w/rough-in ready for completion. 3 car garage w/sep area for golf cart! Level lot for private pool. FINAL OPPORTUNITY to own a stunning, Fischer and Frichtel, Classic Series home in the desirable Miralago Estates neighborhood! The highly anticipated, Phase 3, cul de sac home-sites are now available. Get the best value for a new, luxury home w/outstanding features & personalize your home to fit your unique needs w/the assistance of a prof designer. Choose from 7 exquisite plans. The Wyndham is a dynamic, 4 BD, 3.5 BA, 3,752+ sq ft, 1.5 story. Features inc a 3 car garage, 9 x2019; ceilings, hardwood Foyer floor, Study, huge Bonus Rm, Loft, Frml DR, 42 x201D; cabinets, W/I pantry, Kit Island, 50 gal water htr, R 38 ceiling insulation and more. A number of these home sites back to the stunning, 65 acre, Scott A Lewis Park and to its 25 acres of picturesque lakes! This natural landscape provides a spectacular setting w/abundant trees, green space & walking trails. Enjoy this fantastic location near the restaurants, shops & recreation on Mid Rivers Mall Dr. There is easy access to Hwys 364, 40 & 70. Fabulous lot just waiting for a pool! Privacy abounds in this beautiful 1.5 story home sits on 1.28 acres in St. Peters in a quiet, tree filled neighborhood. Enjoy a glass of wine with friends in the 4 seasons room while the young uns play soccer in the huge level backyard! 4 generous sized bedrooms, 3 full baths with 2 half baths on main floor, beautifully remodeled kitchen in 2017 with stainless steel appliances, solid surface countertops and gorgeous wood look ceramic tile, remodeled bathrooms, new HVAC, roof, gutters and garage door in 2016. Finished walk out lower level includes a freshly carpeted rec room, possible office area, and a new full bath with lots of storage including a cedar closet. Main floor master and laundry. Bonus craft room/sitting area off one of the upstairs bedrooms. 2 car side entry garage and a detached workshop/shed for all the extras. FINAL OPPORTUNITY to own a stunning, Fischer and Frichtel, Classic Series home in the desirable Miralago Estates neighborhood! The highly anticipated, Phase 3, cul de sac home-sites are now available. Get the best value for a new, luxury home w/outstanding features & personalize your home to fit your unique needs with the assistance of a prof designer. Choose from 7 exquisite plans. The Hadleigh is a 4 BD, 2.5 BA, 3,385+ S/Ft, rear staircase 2 story. Features inc a 3 car garage, 9 x2019; ceilings, hardwood Foyer floor, Living Rm, Frml DR, 42 x201D; cabinets, W/I pantry, Bonus Rm, HUGE Mstr W/I closet, 50 gal water htr & R 38 ceiling insulation. A number of these home sites back to the stunning, 65 acre, Scott A Lewis Park and to its 25 acres of picturesque lakes! This natural landscape provides a spectacular setting w/abundant trees, green space & walking trails. Enjoy this fantastic location near the restaurants, shops & recreation on Mid Rivers Mall Dr. There is easy access to Hwys 364, 40 & 70. Gorgeous2 story,COMPLETELY REMODELED! xD; xA;TONS of upscale upgrades! xD; xA;Almost everything is BRAND NEW! xD; xA;New kit w/beautiful Sonoma cabs,spacious island,Quartz counters,new appliances: stainless steel stove,micro&dishwasher. xD; xA;Completely remodeled,HUGE,beautiful lower level,perfect for entertaining! xD; xA;All new,Interlock flooring&carpeting throughout xD; xA;Stunning designer glass front entry door! xD; xA;NEWgarage doors! xD; xA;NEW lights throughout . xD; xA;Crown molding xD; xA;Dual heating&cooling. xD; xA;2 new water heaters! xD; xA;New furnace&A/C 2nd floor! xD; xA;GREAT 2nd floor,loft/bonus area. xD; xA;HUGE master bdrm suite w/coffered ceiling. xD; xA;Beautiful new freestanding tub w/tower faucet in gorgeous master bath! xD; xA;Main level &upstairs baths have new vanities w/Quartz&Carrara marble tops,brand new chrome upscale faucets&finishes! Gorgeous tile surrounds&flooring in both upstairs baths! xD; xA;Aggregate drive&sidewalk . xD; xA;Deck,w/beautiful new landscaping-front&back. xD; xA;Prof.basketball/tennis half court built in2003 for$19,000+,brand new netting. Nestled on 2+ wooded acres at the back of a cul-de-sac, this multi-level stunner in Cottleville is a rare find. The moment you open the door, you are greeted by an open, airy great room accented by a beautiful brick fireplace with buck insert and a vaulted ceiling with skylights. The kitchen features plenty of storage space, new appliances and open flow to the dining area. Enjoy the large deck overlooking the backyard which is home to a diverse population of birds and wildlife. The upper level boasts three large bedrooms and two full baths including a large master bath with vaulted ceiling and skylight. The partially finished walkout lower level offers a full bath and large open entertaining space with wet bar. The attached 2 car side entry garage along with a detached 2 car garage allow plenty of space for cars and recreational vehicles x2013; especially the golf cart you x2019;ll want for cruising to cart-friendly Cottleville x2019;s many restaurants, shops, park spaces, and community events. FINAL OPPORTUNITY to own a stunning, Fischer and Frichtel, Classic Series home in the desirable Miralago Estates neighborhood! The highly anticipated, Phase 3, cul de sac home-sites are now available. Get the best value for a new, luxury home with outstanding features & personalize your home to fit your unique needs with the assistance of a prof designer. Choose from 7 exquisite plans. The Woodside is an elegant, 3 BD, 2 BA, 2,480+ sq ft split bdr ranch. Features inc a 3 car garage, 9 x2019; ceilings, hardwood Foyer floor, Study, Bonus Rm (Opt Bdr 4), Frml DR, 42 x201D; cabinets, angled center stairs, 50 gal water htr, R 38 ceiling insul & more. A number of these home sites back to the stunning, 65 acre, Scott A Lewis Park and to its 25 acres of picturesque lakes! This natural landscape provides a spectacular setting w/abundant trees, green space & walking trails. Enjoy a fantastic location near the restaurants, shops & recreation on Mid Rivers Mall Dr. There is easy access to Hwys 364, 40 & 70. FINAL OPPORTUNITY to own a stunning, Fischer and Frichtel, Classic Series home in the desirable Miralago Estates neighborhood! The highly anticipated, Phase 3, cul de sac home-sites are now available. Get the best value for a new, luxury home with outstanding features & personalize your home to fit your unique needs with the assistance of a prof designer. Choose from 7 exquisite plans. The Arlington II is a dynamic, 3 BD, 2 BA, 2,496+ sq ft ranch. Features inc a 3 car garage, 9 x2019; ceilings, hardwood Foyer floor, Frml DR, 42 x201D; cabinets, W/I pantry, large Kit island, Hearth Rm, 50 gal water htr, R 38 ceiling insulation & more. A number of these home sites back to the stunning, 65 acre, Scott A Lewis Park and to its 25 acres of picturesque lakes! This natural landscape provides a spectacular setting with abundant trees, green space & walking trails. Enjoy this fantastic location near the restaurants, shops & recreation on Mid Rivers Mall Dr. There is easy access to Hwys 364, 40 & 70. Welcome home to this beautiful 4 bedroom 3 bath ranch with a study in the highly desirable Legacy Point subdivision. You will love the LARGE corner lot! There's no shortage of space with a full finished basement and nearly 2500 sq ft of living area. An entertainers dream when you step in the kitchen with stainless appliances, gleaming granite countertops, 42 x201D; cabinets, large pantry, and hearth room leading out to your large deck. Soaring vaulted ceilings, divided bedroom floor plan, beautiful wood floors, and so much more. Pride of ownership shows in this home. Spacious master suite with coffered ceiling and glass doors opening to the deck. Luxury master bath with dual vanities, walk in closet, and separate shower and tub. HUGE 3 car garage with 4th car tandem thats used as a workshop/hobby area complete with AC and heat! Mother in Law suite in lower level with full kitchen and walkout! Make your appt today! Situated on a park like 1.43 acre home site in the centrally located Highland Trails neighborhood, this property is a rare find. Newer hardwood flooring added throughout the 1st floor. (Except tile in Laundry) Fantastic kitchen boasts 42 staggered height cherry cabinets with crown, roll-out shelving, in-under & above cabinet lighting, huge center island, Silestone countertops & stainless appliances. Spacious breakfast room walks out to the deck overlooking the huge private rear yard. Cozy hearth room with fireplace just off the breakfast room. Nicely finished walkout lower level with a huge rec room, full bath & atrium doors to patio. Large main floor laundry w/newer front-load LG washer/dryer. New roof and Trane HVAC Heat Pump system in 2014. Siding soffit & facia 2007. Low-E insulated windows 2005. Storage out-building and large garden space. Country setting, yet close to everything. Don't Delay! FINAL OPPORTUNITY to own a stunning, Fischer and Frichtel, Classic Series home in the desirable Miralago Estates neighborhood! The highly anticipated, Phase 3, cul de sac home-sites are now available. Get the best value for a new, luxury home w/outstanding features and personalize your home to fit your unique needs w/the assistance of a prof designer. Choose from 7 exquisite plans. The Carver is an elegant, 3 BD, 2.5 BA, 2,940 sq ft 2 story. Features inc a 3 car garage, 9 x2019; ceilings, hardwood Foyer floor, Study, Frml DR, 42 x201D; cabinets, large pantry, Loft (or Bdr 4), W/I closets in every bdr, 50 gal water htr & R 38 ceiling insulation. A number of these home sites back to the stunning, 65 acre, Scott A Lewis Park and to its 25 acres of picturesque lakes! This natural landscape provides a spectacular setting w/abundant trees, green space & walking trails. Enjoy this fantastic location near the restaurants, shops & recreation on Mid Rivers Mall Dr. There is easy access to Hwys 364, 40 & 70. Pride of ownership! Meticulously maintained and updated this beautiful home 1.5 Story home. Stunning curb appeal w/professional landscaping, wrap around porch, aggregate driveway, & 3 car garage, Main Floor Master w/French doors leading to the back yard. Stunning Master Bath w/double sink vanity, soaking tub, walk in shower & walk in closet. 3 bedrooms upstairs and full bath & separate HAVC system. Great Room w/vaulted beamed ceiling and Gas-fireplace. Kitchen has wood floors w/Granite Countertops, tile backsplash, white cabinets, and breakfast room. All of the doorways in dining room, family room, & kitchen, have been finished with beautiful trim. Main floor laundry and xBD; bath. Fenced backyard with a built-in pool, and covered patio. There is some finish in the basement that is great for entertaining. Located on quiet cul-de-sac. Boasting over 3,000 sq ft (includes 4 seasons room) this gorgeous 4 bd / 3.5 ba St. Peters home is a MUST SEE. Lovely brick home sits on a large lot & features a two car garage, nice landscaping & a fantastic patio with a covered sitting area. A welcoming foyer greats you with white ceramic tile & an elegant chandelier. You will fall in love with the large open floor plan, formal dining room & spacious main floor laundry room. You will do plenty of relaxing in your large family room that features wooden ceiling beams, wood burning fireplace and opens to a spacious 4 seasons room that offers plenty of natural light. An eat-in kitchen offers tons of seating and boast granite countertops, backsplash, some stainless steel appliances & a spacious breakfast room. Home offers plenty of room to spread out with 3 bedrooms & a large master that features an en-suite that includes stand-up shower, dual vanity & large oval tub. A HUGE finished basement is perfect for entertaining.